Right whales were given their names by 19th century whalers who considered them the “right” whales to kill due to the plentiful oil in their blubber and the demand for their baleen, long bone-like plates made of keratin that extend down from the upper mouth used to filter their food, that was used for corsets, buggy whips and other things. 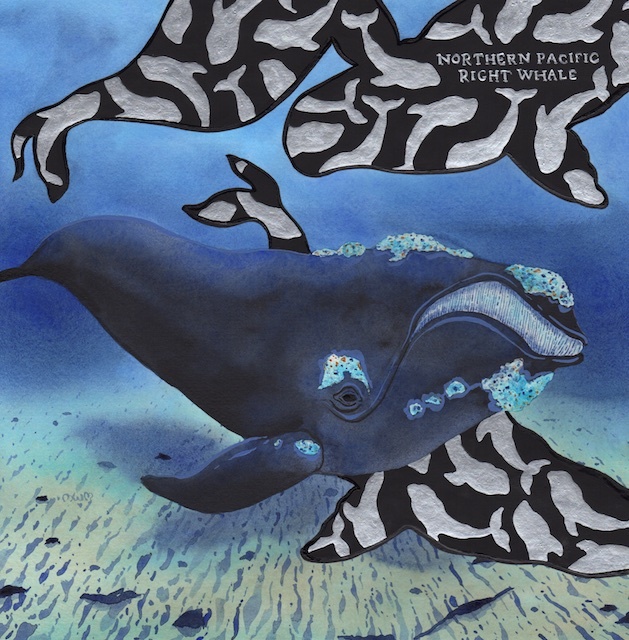 Northern Pacific Right whales are a newly designated subspecies of Right whale that are found in the Gulf of Alaska and the Bering Sea and have been sighted as far south as the California coast and the waters of Hawaii. They can weigh up to 70 tons and range from 45-55 feet in length. Their enormous head takes up a third to a quarter of their length. They eat primarily zoo-plankton and live 50 or more years. The females do not mature sexually until ten years of age and their gestation for a single offspring takes a full year. The fierce whaling of the 18th and 19th centuries nearly led to their extinction with many thousands of whales killed. While prohibitions on whaling were begun in the 1930’s, notably Japanese and Russian whaling continued for many decades. Today the Northern Right Whale is the most endangered of any whale species with only one or two hundred surviving. Continued threat to the few remaining whales include ship strikes with the heavy transpacific shipping lines, entanglement in enormous fishing nets of commercial fisheries, high decibel sonar testing of the U.S. military and even continued poaching. Northern Atlantic Right Whales are similarly endangered with only approximately 400 whales surviving.